For many years now I’ve been using the downloaded Standard version of TurboTax to file my income taxes. I have three codes for online versions of TurboTax to give away to my readers. These codes are good for any one of Standard, Home and Business, or Premier versions. I had intended to prepare my 2014 taxes and write a review, but I’m still waiting for so many tax slips that this is not feasible. I can say that TurboTax has worked very well for me in the past, although I prefer the downloaded version over the online version. Another benefit of going to my site when reading a post is to see the comments other readers leave on that post. All entries received before noon Eastern Time on Thursday, March 5th will be considered for the draw. I will make a random draw without favouring any particular entries. I reserve the right to eliminate entries that I judge to be outside the spirit of the contest. Good luck! Jonathan Chevreau waded into the current debate on TFSAs and made a case in favour of Tax-Free Savings Accounts. While others debate whether TFSAs allow the wealthy to shelter too much income from taxes, Chevreau’s main argument is that “TFSAs merely eliminate double and triple taxation.” This just isn’t true. This so-called double and triple taxation is actually the first-time taxation of new income in taxable accounts. Your original capital is not taxed again. When your already-taxed money earns interest or dividends, only the new income gets taxed, not the original capital. When you sell an investment, you only pay capital gains taxes on the growth in value, not the original principal. Once again, it is only the new gains that are taxed. In fact, only 50% of the new capital gains get taxed. So, wealthy Canadians are not only free from double taxation, but they pay no taxes at all on a significant portion of their returns. An argument that actually makes some sense, but Chevreau didn’t make, is that when you view your finances after accounting for inflation, the parts of capital gains that are just keeping up with inflation do get double-taxed, in a sense. However, the 50% capital gains tax exemption more than remedies this problem. I’m not in any hurry to pay more tax than I have to. I’m in a position to benefit greatly if TFSA limits get raised. But we shouldn’t try to justify giving more tax breaks to the wealthy with a bogus argument about double taxation. The famous Monty Hall problem has been analyzed in great detail, but those new to it still get the answer wrong, even some professional mathematicians. I’ve had several arguments about it, but I’ve found only one way to convince people of the correct answer: offer to bet. You’re on a game show. There are three doors. You’re told there is a car behind one door and a goat behind each of the other two doors. You’re asked to pick the door you think has the car. After you choose, the game show host, Monty Hall, opens one of the other doors to reveal a goat. Monty then asks you if you want to stick with your door or whether you want to switch to the other unopened door. Should you switch? To make things more precise, here’s some additional information: before the game began, Monty intended to open a door you didn’t pick to show a goat (no matter what door you chose), and he intended to offer you a chance to switch. It’s well known that the probability of winning the car is one-third if you don’t switch and two-thirds if you do switch. However, a great many people feel certain that the odds are 50-50 either way. The challenge is to convince them they’re wrong. The only way I’ve ever had success, particularly when the argument has an audience, is to offer to bet. Suppose that Frank believes the odds are 50-50 and wants to bet with me. To simulate the game, we appoint a neutral party to play the role of Monty. Monty rolls a fair die where he can see it but nobody else can see it. The outcomes 1 and 2 mean the car is behind the first door, 3 and 4 the second door, and 5 and 6 the third. I let Frank pick a door. Then Monty tosses a fair coin (whose outcome only he can see) to choose which other door to open. The coin toss is only needed when Frank chose the correct door, but Monty tosses the coin every time to avoid revealing information. Then Monty reveals the die to show us whether Frank picked the right door. If Frank is right about the odds, he will have the correct door half the time. If I’m right, Frank will have the correct door one-third of the time. Based on Frank’s 50-50 odds, it would be fair to bet $2 on each play. Based on one-third and two-thirds, it would be fair for Frank to pay me $2 when he has the wrong door and for me to pay Frank $4 when he has the right door. To split the difference, we make it so that I win $2 when Frank has the wrong door, and I lose $3 when Frank has the right door. This way, both Frank and I believe we’ll make money over time. The goal with all this talk of betting isn’t to make any money. I’ve found that people like Frank start to have doubts when real money gets involved and they begin to think. They slowly realize that they only win if their original door choice matches the roll of the die, which will happen one-third of the time. The first time I had a serious argument about Monty Hall, I was a summer student who was too foolish to realize it’s a bad idea to make a senior engineer look foolish over trivial matters. The talk of betting ended the public argument with “Frank,” and I got a private admission a few hours later that he was wrong. I wasn’t very popular with Frank’s crowd the rest of that summer. So, it’s probably a social mistake to argue about Monty Hall in the first place, but if you actually want to change someone’s mind, my experience has been that offering to bet on Monty Hall simulations is very effective. Big Cajun Man isn’t happy about the barrage of different types of bill notifications he faces now that most of his bills don’t arrive on paper. My wife and I deal with this by paying bills early and setting our own notifications. We find we can pay bills just twice a month on our own schedule. Many bills get paid well before the due date, but that’s fine with me. Findependence Hub has some sensible thoughts on a “core and explore” approach to investing. Preet Banerjee’s latest video explains how RRSP contributions reduce your income taxes. Canadian Couch Potato reports that iShares is introducing some new ETFs for U.S. and foreign stocks with attractively low costs that may be of interest to Canadians. My Own Advisor doesn’t buy the assertion that high taxes on RRSP income in retirement is a widespread problem. Boomer and Echo debate the merits of buying new or used cars. To me, the more important question is whether you save up and pay cash or whether you borrow or (shudder) lease. The world of investing simplifies tremendously once you make the decision not to try to beat the markets. Complications melt away when you just try to take what the market offers at very low cost. A Wealth of Common Sense gave a long list of “underrated questions that most investors don’t bother asking themselves.” Here I answer them from my point of view of a DIY index investor. The list of questions is long, but my answers are short. I don’t make bets based on hunches, so it’s hard to go too far wrong. What are this person’s incentives for giving me advice? I ignore forecasters. I listen to people with advice, but I don’t deviate from my current strategy of low-cost indexing, which is incompatible with most advice. What are the all-in costs for my portfolio? Expressed as percentages of my entire portfolio, MERs are 0.08%, my ETF trading commissions and spreads cost 0.02%, and foreign withholding taxes cost 0.10%. My U.S. ETFs don’t report their trading expense ratios, but I’m confident that this rounds to 0.00%. All-in costs are 0.20% per year, or about 5% over 25 years. What’s my reason for making this purchase or sale? Apart from occasional rebalancing, I buy when I have new savings to invest, and will sell when I need money. I make no trades based on market predictions. Maybe I should give myself a few days before making this change to my portfolio? If I was planning to change my strategy or change my asset allocation, this would make sense. But adding new money to my portfolio requires no cooling off period. What’s my time horizon on this investment? My time horizon is roughly my whole life. I plan to invest money until I need it to spend. Does this strategy fit my personality or is it a case of a square peg in a round hole? I’m quite comfortable with my strategy. When will I sell this investment? When I need the money to spend in less than 5 years. Have I looked at both sides of this trade? I just assume the investor on the other side of my trades knows more than I do about short-term prospects. I plan to hold for a very long time and am not concerned about the short term. How will I react if the markets don’t cooperate with my thesis? My only real thesis is that stock market tends to go up over the long term. I suppose my small cap value tilt could be called a thesis as well. If markets stop going up over the long term, the world is in trouble. I’m currently saving more than 50% of my take-home pay. That’s more than enough. Am I blaming others for this mistake instead of taking responsibility for my own actions? I’m the only one to blame for the mistakes I made in the past playing my hunches. How much will this change in my portfolio really affect my performance? It’s been a long time since I made any portfolio changes other than adding new money or rebalancing. What is my asset allocation including all of my investments? Long-term savings are 30% Canadian stocks, 25% U.S. stocks, 20% U.S. small cap value stocks, and 25% international stocks. Short-term savings are in cash and GICs. What’s my edge in these competitive markets? Because I choose not to compete in the markets, I don’t need an edge. I suppose you could say I get edges from my low portfolio costs and ability to remain cool when market gets volatile. What does the party on the other side of this trade know that I don’t? I assume the parties on the other side of my trades know a lot more than I do. By holding assets for the long-term, I don’t need to worry much about being taken advantage of in the short term. Am I listening to the right sources when taking financial advice? I believe so. I tend to read books about long-term thinking rather than listen to pundits discuss short-term matters. What’s my maximum pain threshold for losing money? I don’t know for certain. I slept fine through the enormous stock market losses in 2008-2009. So, we’d have to face something much worse than this to make me flinch. Am I looking at the market value of my portfolio too often? Probably, but I’ve been improving. I have a spreadsheet that computes many things including portfolio market value and rebalancing thresholds. It now sends me an email if I need to rebalance, so I’ve been more comfortable lately not looking at the spreadsheet for days at a time. Eventually, I hope this grows to weeks at a time. Do I understand the risks and expected returns for this asset? I do understand the risks of my ETFs and how these risks differ between the short term and the long term. I hope for compound average expected real stock returns of 4% per year over the long term. But, I’ll be fine financially if I get substantially less. Could I explain my investment strategy in a 30 second elevator pitch? Index investor. Maybe for the rest of the 30 seconds I’ll practice juggling. Do I have a reasonable time frame in mind for my portfolio? I think the rest of my life (and my wife’s life) is reasonable. What is the underlying liquidity in this investment vehicle? It’s hard to get too much more liquid than the four extremely popular ETFs I own (VCN in Canada and VTI, VBR, and VXUS in the U.S.). What are the tax complications? Tax complications are minimal for RRSPs and TFSAs. In my non-registered accounts I hold only VCN (because of the favourable dividend treatment in Canada) and VTI (because it has the lowest dividend yield of the other three ETFs). Overall, my taxes are quite simple. Am I being patient or just stubborn? This question seems more relevant to active investors holding on to a poorly-performing stock. In any case, index investing requires patience (absenteeism helps, too). I’ve got the patience, but I’ve not mastered being absent. I still pay too much attention to my portfolio. It’s hard to be more diversified than owning just about every stock on the planet. Some will criticize the lack of bonds in my portfolio. The diversification benefit of bonds is minimal and is swamped by the fact that bonds’ expected returns are so much lower and expected stock returns. The main benefit of bonds is controlling short-term volatility. Over 20 years or more, there’s not much difference between historical stock and bond volatility. What are the alternatives to this investment? Again, this question seems more suited to active investors. I have choices of different index ETFs to cover the various asset classes. I’ve made my choice and have no current plans to change it. Will my assets cover my future liabilities? If I work for a little while longer, the answer is yes. Do I understand the risks involved with this strategy? My strategy is fairly simple. The main risks are that I’ll become either fearful or overconfident and deviate from my strategy. Other than that, multiple decades of poor stock returns world-wide could cause me problems. But I’m guessing this would be a sign of much bigger problems than whether I have enough money to travel 4 times per year. I used to try too hard. Now I just take what the markets give me. Does this person offering advice on TV have the same time horizon as I do? I rarely listen to advice from talking heads on TV, so their time horizons don’t matter much to me. Am I anchoring to current or past price points? This is another question mainly for active investors. No, I don’t anchor to past price points. Are this portfolio manager’s past results too good to be true? I don’t invest with active portfolio managers, so their past results aren’t relevant to me. Am I allowing my confirmation bias to cloud my judgement? I managed to break out of my confirmation biases when I made the decision to abandon active stock picking. I’m sure I suffer from confirmation biases in some parts of my life, but it isn’t relevant to indexing. Am I the sucker here? Seems unlikely. I suppose some new government could simply confiscate or tax away my savings. Or maybe all index funds could be forced to include “investments” in some form of public spending. Am I chasing past performance? In a sense. I base my return expectations on roughly the past century of real stock returns less some margin for safety. But I don’t chase recent past outperformance. Am I imagining that past market scenarios were easier than they really were at the time? I know that we are all prone to 20/20 hindsight. However, this isn’t relevant to buy-and-hold index investors. Is this data important or just interesting? I can only assume that this question is relevant to those looking for an edge over the markets. I’m not seeking such an edge other than accepting short-term volatility in exchange for higher expected returns. Am I working with a marketing firm or an investment firm? I own Vanguard ETFs. Vanguard is definitely an investment firm. How did I react during past periods of market turmoil? I slept fine and didn’t sell during the tech crash and then again during the 2008-2009 financial crisis. Do I really understand my appetite for risk? My biggest test was the 2008-2009 financial crisis, and I didn’t have any trouble. Am I practicing first or second level thinking? I strive to use second-level thinking for most things in my life, but it isn’t necessary for index investing as long as I don’t stray toward making some active bets. Does this person have my best interests in mind? I assume most people don’t have my best interests in mind. Can I stick with my process when things don’t go as planned in the future? My plan allows for significant volatility of year-to-year returns. So, it would be difficult for things to work out differently from my plan. However, I believe I can stick to my process. 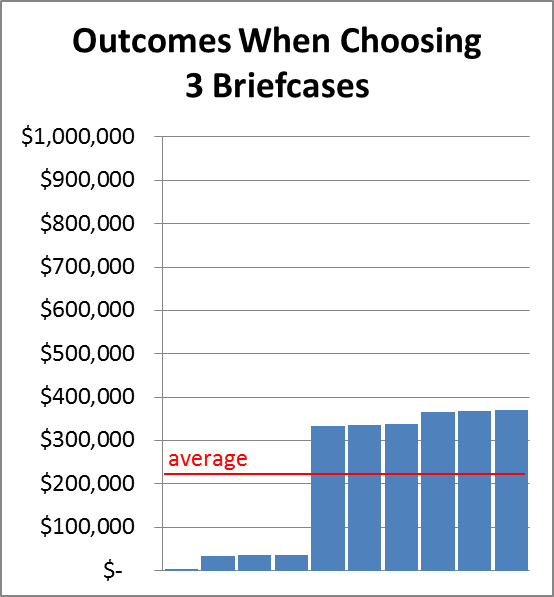 Am I anchoring to a bad investment or staying disciplined to a good process? This is another question more relevant to active investors. Anchoring doesn’t seem to be a problem for index investing. One thing that should have been clear reading through all these questions and answers is that index investing is a lot simpler than trying to beat the market in one way or another. Hidden costs in currency exchange are bigger than most people realize. To exchange large amounts of Canadian and U.S. dollars, I use a version of the “Norbert Gambit” by buying and selling Royal Bank stock in different currencies. The exact procedure is different at every discount broker. I use BMO InvestorLine and recently had to change my procedure slightly. You may ask why I don’t just use my broker’s currency exchange system. The answer is cost. The last I checked, if I started with C$10,000, converted to U.S. dollars, and then converted back again, I’d have been left with about C$9700 or about C$300 less. For C$100,000, the round trip cost was about C$1150. By doing the currency exchange myself using Royal Bank stock, I can bring these costs down to an average of about C$50 on C$10,000 and about C$100 on C$100,000. These are average costs because Royal Bank stock prices can move around in the few minutes I hold them, but the movement will help me about as often as it will hurt me. Below is the detailed procedure I follow at BMO InvestorLine to sell an ETF traded in Canadian dollars and buy a U.S. ETF traded in U.S. dollars. This can be used for trading stocks as well. It’s fairly simple to modify the procedure to go in the opposite direction (U.S. ETF to Canadian ETF). I offer no guarantee that it will work for you. I find I have to change my procedure occasionally to adapt to changes in my discount broker’s behaviour. 1. Check that the next three trading days are the same in the U.S. and Canada. I don’t proceed further unless this is true. It takes three days for trades to settle. If the settlement date is different in the U.S. and Canada, this can cause a short position and lead to an interest charge. 2. Sell Canadian ETF. Perform all four trades in steps 2 to 5 one immediately after the other on the same day, making sure to get the currency right for each trade. 3. Buy RY stock in Canada. I use the number of Canadian dollars I want to exchange for U.S. dollars. This can be more or less than the proceeds from selling the Canadian ETF. 4. Sell RY stock in the U.S. This should be the same number of shares as I purchased in step 3. 5. Buy U.S. ETF. This purchase of the U.S. ETF uses the proceeds of the U.S. RY sale as well as possibly some U.S. cash that had been in the account. 6. Send a message requesting that the long position in Canadian RY and short position in U.S. RY be “flattened” before the trades settle. BMO InvestorLine has a “MyLink” system for sending email-like messages to their representatives. This is the part of my procedure that has changed most recently. BMO InvestorLine’s “system automatically flattens the holding one business day after settlement.” This leads to a 21% daily interest charge later in this month or next. The interest is usually for only one day, but it is three days if the settlement is on a Friday, and the account flattening happens the following Monday. 7. Set a Calendar reminder 45 days later to check if I was charged interest. It can take a long time for spurious interest charges to appear because they show up on a fixed day every month. 9. If interest was charged, set another calendar reminder 5 business days later to confirm that the interest charge was removed. The interest charge has always been removed for me, but in theory, I might have to do another round of messaging and checking later whether the problem is fixed. All this may look like a lot of work, but it isn’t too bad at all. Laying it out in all this detail makes it seem worse than it is. It’s definitely worth it to me to save hundreds of dollars. My article debating what income level is safe in retirement got a mention in the Findependence Hub’s Weekly Wrap. 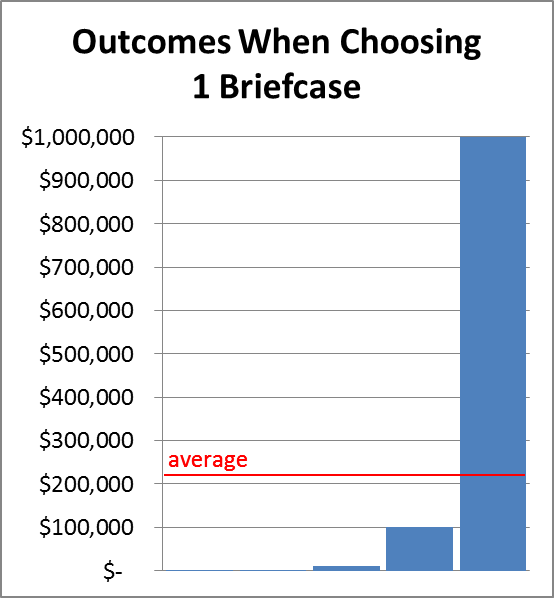 It’s important to be realistic about both portfolio returns and the effect of costs. Helaine Olen at Slate.com explains why financial literacy can’t work and we need better consumer protection in financial services. The way I see it, we should focus on consumer protection at the macro scale of governments and laws. It still makes sense for parents to try to teach their children financial skills, and it makes sense for adults to try to educate themselves. But financial literacy programs can never be an effective substitute for consumer protection laws. Few of us can defend ourselves against predatory practices disclosed in deliberately confusing contracts. Dave Liggat describes how to use a Google spreadsheet track your investments in various accounts as a single portfolio and calculate the deviation from your target allocation. This is very similar to the way I track my own portfolio. Over time I’ve added calculations to decide when it makes sense to rebalance and send me an email alerting me to do so. Preet Banerjee has a video showing that renting a home isn’t necessarily a waste of money. Renting can certainly make sense as long as you actually save and invest the extra money you would have spent on a mortgage and home maintenance. Million Dollar Journey suggests two ETF-based index portfolios and explains which portfolio is best for each of the major discount brokerages. Big Cajun Man says some important things you can do for your retirement are to exercise and quit smoking to improve the odds you’ll be alive to enjoy your retirement. Boomer and Echo expain how to get access to money in a locked-in retirement account due to financial hardship. My Own Advisor has some advice for an investor just starting out. Fred Schwed, Jr.’s classic book Where Are the Customers’ Yachts? had me laughing from beginning to end. Written in 1940, you’d think that his “Good Hard Look at Wall Street” would paint a very different picture from what we see today, but most of his insights are still very relevant. Rather than demonizing the people on Wall Street, Schwed paints a hilarious picture of fallible people who are at least as effective at fooling themselves as fooling others. One area where the financial world has changed considerably is lending. A banker’s “business might be defined as the lending of money exclusively to people who have no pressing need of it.” Today’s banker is more likely to hunt you down and force money into your pockets until just before the point where, if everything goes perfectly smoothly in your life, you can just barely handle the interest charges. Wall Streeters tend to advise buying under the right conditions. “But when ‘conditions’ are good, stocks are high. Then without anyone having the courtesy to ring a warning bell, ‘conditions’ get bad. Stocks go down, and the margin clerk sends the forward-thinking investor ... the only piece of financial advice he will ever get from Wall Street which has no ifs or buts in it.” Buy high and sell low has been around for a long time. “It is a fair thing to say of a piston, an elevator, or a golf ball at a certain moment, that it is ‘going up.’ ... But it is not a fair thing to say of the stock market, which, not being a physical thing, is not subject to Newton’s laws of propulsion.” I tried to make the same case that the stock market lacks momentum in the same sense as a physical object and that we can’t count on prices to continue as they have been in the recent past. However, Schwed is much funnier than I am. Over several pages, Schwed likens chart reading (technical analysis) to predicting coin tosses, examining roulette wheel histories, and astrology, all with good humour. Stock “manipulators” may aggressively buy a stock to drive up its price and try to spark interest in the stock. “At this point the gullible public is supposed to come galloping in to buy the stock from the manipulators at still higher prices. But not infrequently the gullible public acts like an overfed trout and just pays no attention.” So manipulation is frequently unsuccessful. I highly recommend this book as a funny read that manages to teach some interesting lessons along the way. Despite all the changes that have taken place over the past 75 years, it’s amazing how much is still the same. In my quest to find different ways of explaining investing concepts, I have a new idea for explaining the value of diversification based on a hypothetical game show. 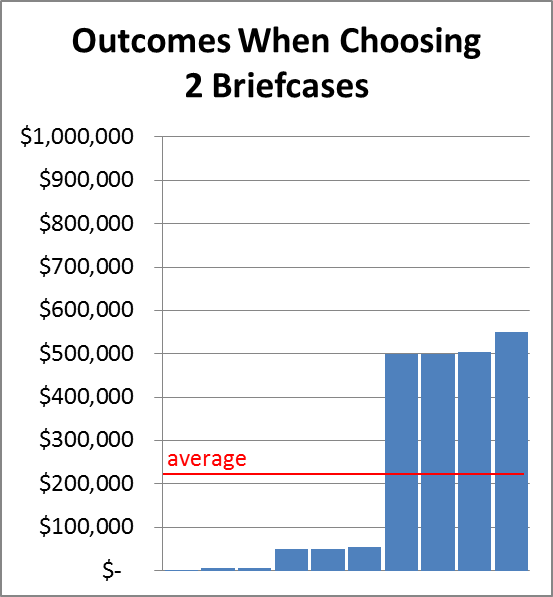 It shows the trade-offs between concentrating your bets and spreading them out. You’ve beaten the other contestants to make it to the prize round of the TV game show “No Guts—No Glory” to take a shot at winning up to a million dollars! 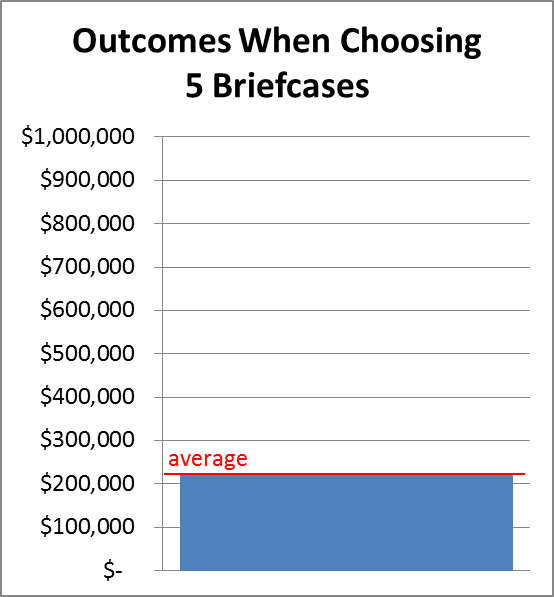 There are five briefcases, each containing a different amount of money: $100, $1000, $10,000, $100,000, and $1,000,000. But they are in a randomly-selected order. 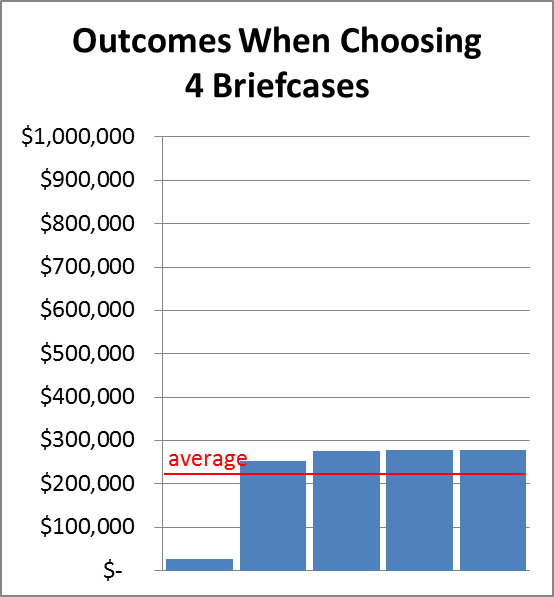 We’ve talked ourselves all the way from a concentrated bet on one briefcase trying to win a million dollars all the way to the safe choice of a sure $222,220. This is analogous to the difference between picking a small number of stocks and owning (almost) all stocks through index ETFs or mutual funds. Assuming your stock choices are random, the expected outcome is the same, but the volatility is higher the fewer stocks you own. The only way to beat the stock market soundly is by making concentrated bets. Unfortunately, this is the way to lose badly to the market averages as well. For those who think they don’t mind some extra volatility, there’s a wrinkle. As you compound your returns over the years, higher volatility skews your possible returns more and more. This means the odds of beating the market become progressively smaller. A small number of stock pickers make huge gains at the expense of the masses of other stock pickers whose returns lag the markets. Canadian Couch Potato warns not to overreact to foreign withholding taxes. Small portfolio improvements are possible by locating assets in the best accounts, but it makes no sense to avoid RRSPs and TFSAs just so you can recapture some foreign withholding taxes in a non-registered account. Million Dollar Journey shows how to construct simple and fairly low-cost portfolios at each of Canada’s big banks. He’s right that many people don’t want to leave their current bank. Big Cajun Man doesn’t like the idea of insurance companies tracking information about how we drive. I’m definitely with him on this one. The idea that insurance companies would seek to collect this information for any reason other than increasing profits is laughable. The Blunt Bean Counter discusses the tax issues that come up at your death if you own shares of a Canadian-Controlled Private Corporation. My Own Advisor is giving away access codes for the online version of TurboTax. That’s right—it’s getting close to tax time. Boomer and Echo review Elizabeth Warren’s book All Your Worth. I get a lot of great feedback from my readers. I get other email as well. Here is another installment of replies to emails that I usually ignore (see previous installments here and here). Thank you for your offer to pay me so you can spam my readers with forex trading ads. It turns out that I don’t keep a list of my readers’ email addresses. Also, I don’t hate them. But if both of these things change, I’ll let you know. Thank you for your email offering to sell me your penny-stock domain name as well as all three of your follow-up queries. In the careful study of my web site that you mention, you no doubt saw the synergy between my writing and pushing penny stocks. It’s baffling that I made no offer for your domain. I have no explanation. Thank you for yet another chance to join your forex affiliate program. I know that retail investors who do forex trading almost always lose money fast, so your offer of up to 2 pips of revenue sharing might be lucrative for me. Unfortunately, I worry that some of the people enticed by your forex platform might be people I care about, or have met, or might meet in the future. There are many books about the 2007-2009 financial crisis, but what sets Alan S. Blinder’s After the Music Stopped apart is that it is “less of a whodunit and more of a why-did-they-do-it?” Where other books focus on the spectacle of Wall Street CEOs madly rushing around to emergency meetings, Blinder gives the reader a better understanding of what went wrong. One striking chart early in the book is U.S. house prices adjusted for inflation. It is very flat for nearly a century and suddenly doubles in less than a decade. Then prices drop back down to previous levels even faster. On 2007 July 8, then CEO of Citigroup, Chuck Prince, said “When the music stops ... things will be complicated. But as long as the music is playing, you’ve got to get up and dance. We’re still dancing.” While the music played, house prices rose fast, and when the music stopped, house prices dropped like a stone. In a 2005 survey of San Francisco home buyers, on average they expected house price increases of 14% per year for the next decade. In Los Angeles, they expected 22% per year. These insane numbers reminded me of the crazy expectations during the tech boom where I heard people talking about retiring and making 15% or 20% per year on their investments. Wall Street firms were leveraged 30-1 to 40-1. This means that “a mere 2.5 percent decline in the value of your assets wipes out all shareholder value.” As long as they sold the risk of mortgage defaults and institution defaults to others, this wasn’t a problem for them. But they were caught holding toxic assets themselves when the music stopped. Blinder explains that derivatives were complicated by design. Standardizing derivatives and trading them on organized exchanges would make it easier for traders to understand what they were trading. Creating non-standard and opaque derivatives “enables sharpies to take advantage of suckers.” Also, the fees embedded in non-standard derivatives are much higher than they would be in standardized derivatives. Blinder doesn’t find the phrase “too big to fail” precise enough. He says that the real problem is that some financial institutions are “too interconnected to fail,” or that they are too interconnected to be allowed to fail messily. Public perception is that while the U.S. government gave massive amounts of money to banks, little was done to help homeowners. In fact, there many programs created to help homeowners, but they all operated too slowly to help prevent many foreclosures. So, the public perception is not too far off the mark. Blinder devotes considerable effort to summarizing events to set up his prescription for reducing the odds and severity of similar problems in the future. This includes political actions as well as regulatory changes. Overall, Blinder delivers on his promise to give insight into why the financial crisis unfolded as it did rather than just describing events. I recommend this book to anyone with an interest in a better understanding of the U.S. Federal Reserve System and macroeconomics in general. Others will likely want to pass on this book, despite the fact that Blinder went to some trouble to make it accessible to non-specialists.